At least for one specific make and model. Not long ago we learned that manual transmissions are becoming more expensive in certain segments, specifically hatchbacks. This is very much in contrast to only a few years ago when manuals were offered on base models without additional charge. Today, automatic and/or dual-clutch transmissions are becoming standard fare, and manual seekers are often being forced to pay more as automakers group manuals into more premium packages. However, there’s currently one make and model where opting for the manual is actually cheaper, at least for this month. And the vehicle in question is not a hatchback, but rather a purist roadster. 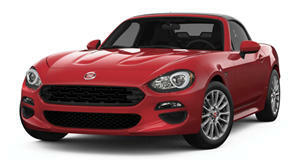 Fiat has introduced a $1,500 bonus on manual-equipped 2019 124 Spiders in the Classica, Lusso, and Abarth trims. It doesn’t matter whether one buys or leases the little roadster. There are also some decent but not great incentives in place that can be combined with the above bonus. For example, the remaining 2018 models still in stock are also being offered with a $1,250 rebate, for a total of $2,750 in savings. The 2019 models, however, only have a $250 customer cash rebate currently, which adds up to $1,750 off. Still, the fact that Fiat has a sale on manual-equipped 124 Spiders is great to see. Meanwhile, Mazda is not currently offering any incentives on the MX-5 Miata, the 124 Spider’s twin. So there’s that to consider. To compare, you can finance a 2019 124 Spider with 0.9 percent APR for 48 months plus the $1,500 bonus for manual-equipped versions. The best deal you can currently get on a Miata is 2.9 percent APR for 72 months, and no cash back. Leasing, at least for the Fiat, is actually more expensive in some markets. Given that manual transmissions are becoming less common and are typically being regulated to more niche models and higher trim levels, the fact that Fiat is offering this deal in the first place is impressive. However, we don’t know how long it will last. Will the new "Fiata" be the sports car we've all dreamed about?